For three years, Millennium pushed every boundary as a television series from 1996 to 1999. Hard to describe using only a few words, it was an award-winning drama created by Chris Carter, attempting to explore psychological terror, demonic forces, the upcoming millennium, supernatural events, The Bible and secret cult-like groups. In other words, it was a TV show that was ahead of its time, getting cancelled way too soon. Hoping to rejuvenate the franchise, Back to Frank Black: A Return to Chris Carter’s Millennium, reexamines the series and the filmmakers who helped create the program. While Chris Carter is better known for his work creating The X-Files, Millennium, oftentimes, gets overlooked. Its central protagonist, Frank Black, uses an unscientific approach to capture the real-life monsters that live within the shadows in our everyday lives. And just like the character, the TV show is often misunderstood. Through a series of essays, interviews and synopses, multiple authors explore the dark universe where Frank Black lived and offer a beacon of hope for the character’s future. Beginning essays seem to be short but sweet, hinting that there could be more hidden within the Ten Thirteen wheelhouse for Frank Black. Joseph Maddrey pontificates the series’ transition from Terror Gothic to Apocalyptic Gothic programming, along with exploring the complex character traits that comprise Frank Black. John Kenneth Muir offers the unified theory of the franchise, which is intriguing. From the outside looking in, each season is unique and feels like there’s no common theme to bridge them all together, other than a few main characters. But I can actually buy into his alignment of the Tibetan funerary text, Bardo Thodol, that details three unique spiritual ways of knowing, with the series. Bardo Thodol offers one separate belief for each of the TV show’s seasons! There’s an essay written by Jordan Black herself, Brittany Tiplady, looking back at the time she spent on the show, as well as one of the best chapters of the book covering the animal symbolism in Season 2, which also happens to be one of the shortest. I really would’ve liked to see that topic explored a bit more. The essays are great, but the highlights of the book involve interviews with the primary filmmakers. In A Conversation with Chris Carter, James McLean and Troy L. Foreman discuss the struggle for creating a primary antagonist in the series’ first season, as well as the admission by the series creator that The X-Files: I Want to Believe may have been a better movie featuring the characters of Millennium. Also, Carter took the blame for Millennium‘s premature ending. He’d hoped to continue the series past Season 3, but by creating Harsh Realm, he unknowingly sealed the fate for Frank Black et al. Lance Henriksen says Carter was very shy, never wanting to discuss possible story and character ideas with the actor. His all-time gripe involved wrapping each case at the end of every episode. Henriksen really hoped to create ongoing storylines where many cases overlapped each other throughout the season. And he’s quite willing to return to the character, hoping it’s a feature film. It’s good to hear from Composer Mark Snow, who had an almost endless amount of creative freedom, while creating the music for The X-Files and Millennium, and the Frank Spotnitz interview peers behind the scenes of working on Millennium, The X-Files and other TV series and movies. He’d be interested in returning to Frank Black, but notes the longer it takes to get the project green-lighted, the less likely it’ll actually happen. Another highlight of the book features conversations with Glen Morgan and James Wong — the filmmaking team who rose to prominence by creating the Peacock characters from The X-Files episode “Home” — who had planned a return for the characters in a Halloween-themed Millennium episode that never aired. It would have been nice to feature more of their mythology contributions of Season 2. Later in the book, Writer-Producer Chip Johannessen, showrunner for Season 3, still seems bitter at Morgan and Wong for their contributions to the series. I vaguely remember the controversy Klea Scott received while as working as Special Agent Emma Hollis in Season 3. Here, a little backstory of the backlash is presented, but more would have been better. There’s no bombshells dropped by any of the cast or crew, but an interview with Michael R. Perry mentions the initial Season 3 showrunner had hesitations about addressing the Marburg virus of the previous season and was quickly replaced. I still haven’t figured out who that showrunner was, but would love to see an interview with him or her to find out what exactly happened. 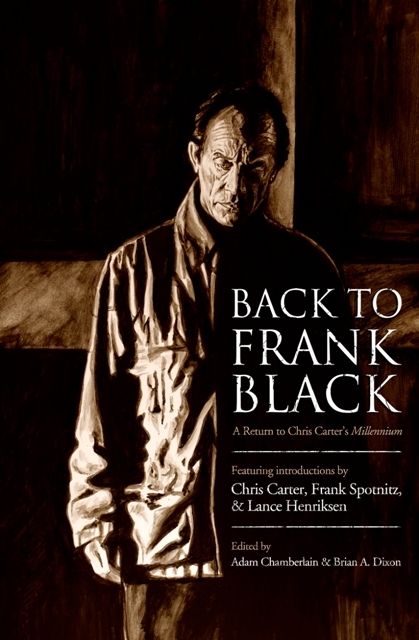 With the creation of the Back to Frank Black campaign during the summer of 2008, almost 10 years after the TV show was cancelled, there’s been thoughts and hopes for a feature-film adaptation, TV movie or even a reboot continuing Lance Henriksen’s adventures. At one point, the program’s filmmakers were very keen on returning to Frank Black, but the studio lost interest… so the character’s big-screen adventures were shelved. Back to Frank Black, as a book, was completed in 2012 and there’s no end in sight for fan (as well as cast and crew) speculation on the return of Millennium. This is not a light read, by any means, but definitely an in-depth exploration of the world created by Chris Carter. The book is a dense journey of nostalgia that’s fun to relive. Chapters are filled with breakdowns of episodes, seasons and dark themes that both casual and hard-core fans can easily understand. I would have preferred the book to include more filmmaker and actor interviews and behind-the-scenes articles concerning the making of the show. While the authors tried to focus on all the big names of the Millennium Universe, a few key players happened to be skipped, including Ken Horton, Darin Morgan and Terry O’Quinn. Offering the perspective of a few more writers from the show would have been a pleasant addition, as well. Millennium fans are full of nostalgia and optimism for the future. Recent developments include IDW Publishing releasing a limited graphic novel series based on Millennium and La-La Lands Records rereleasing the previously sold-out Millennium soundtrack, as well as an all-new second volume of Mark Snow’s score. And with The X-Files returning to the spooky TV series for a six-episode event miniseries in 2016, the time is now to get back to Frank Black. Writer-Editor Adam Chamberlain discusses the Back to Frank Black campaign in my interview and hopes to propel Millennium‘s future by streaming the TV series on Netflix. In a crazy world where one man tries to make sense of all the madness, solutions are difficult. This one is not: Let’s get Back to Frank Black, already! Strength: Millennium shines in the Back to Frank Black spotlight. Weakness: Several topics of the series are overlapped via multiple chapters.